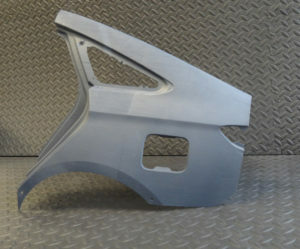 Outer body panel made in one piece. Inner structure made as one portion. There’s just no better way to demonstrate a product or design change other than having a physical model of it. Hence a majority of the reason why additive manufacturing has been used since the mid 80’s. But this OEM really took modeling to the next level with their latest vehicle program. 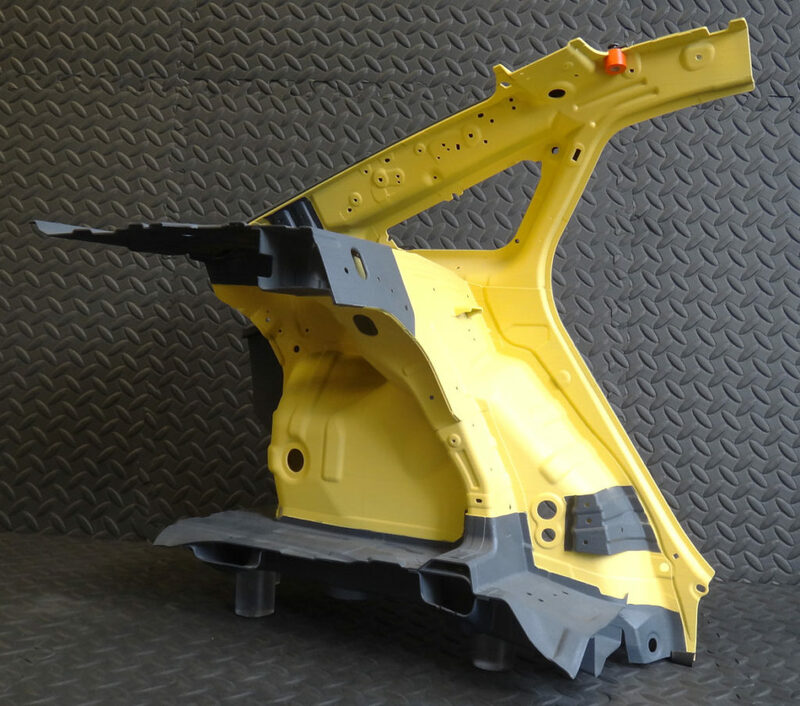 They needed a way to demonstrate proposed changes to the body structure so they decided to have the rear quarter assembly made with additive manufacturing (seen above and below). This 40-scale model was produced as just two separate pieces making it easy to facilitate viewing a complex assembly. 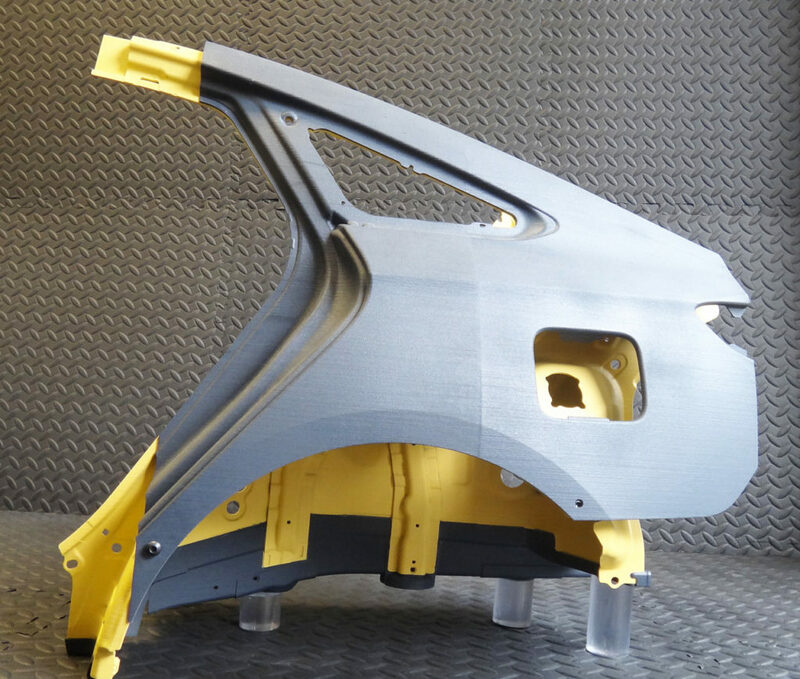 Minor CAD work was also done to increase the thickness of the thin sheet metal to accommodate for GF-Nylon laser sintering requirements during build. 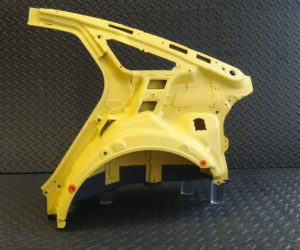 The parts were then masked off after build and “colored” to visually enhance the OEM’s changes. The two pieces where assembled together using some simple thumb screws and mounted on plexiglass rods so that it could stand independently. Overall the project took approximately 3 weeks from start to finish. It traveled half way around the planet for several tech events and back again here in the states where it still maintains its pristine model status. Quarter view of inner structure.